Lovely RL hunt coat. This is a Blue Label Lauren, made in Italy (Lambs wool and Alpaca). Bust is 34", Shoulder 16", Sleeve 25.5 with extra that can come down, Back is 26", single vent in the back. 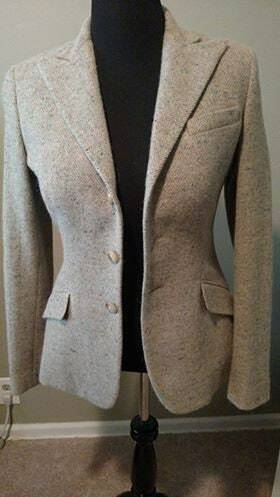 This coat is a rather unual color of oatmeal /beige with flecks of color, would look great with deep gray or brown breeches during cubbing season. Please note this jacket runs very small.... The label says size 10 but it fits as a size 4/6.